Noguchi was born on November 24, 1876, in the village of Inawashiro, Japan. His father deserted the family soon after Noguchi’s birth, and his mother worked in the rice fields to support her two children. In his youth Noguchi fell into an open hearth fire, an accident that left him severely burned and without the use of the fingers on his left hand. Noguchi’s superior performance in grade school brought him to the attention of the superintendent, who eventually arranged for Noguchi to receive reconstructive surgery. Thus developing an interest in medicine, Noguchi became apprenticed to his surgeon, entered Tokyo Medical College in 1894, and earned a medical degree in 1897. He obtained a position as research assistant to bacteriologist Shibasaburo Kitasato at the Institute for Infectious Diseases in Tokyo. In 1899 a medical commission from the United States visited the institute, and Noguchi became interested in studying in that country. Later that year he traveled to Philadelphia and obtained an assistantship to snake­ venom researcher Silas Weir Mitchell. Noguchi investigated the venomous substances hemolysin and agglutinin, and devised sera to protect against them. This work earned him a one­year fellowship to study in Copenhagen, Denmark. In 1904 bacteriologist Simon Flexnet (who had been Noguchi’s first contact in the United States) became director of the newly founded Rockefeller Institute in New York, and he invited Noguchi to join his laboratory. In 1905 Flexner and Noguchi were among the first to confirm German biologist Fritz Schaudinn’s identification of the bacterium Treponema pallidum as the causative agent of syphilis. In 1913 Noguchi proved the long­ suspected connection between syphilis and paresis, a type of slow paralysis, by isolating T. palladium from the brains of people who had died of paresis. At about this time, his credibility began to diminish. In 1911 he asserted that he had isolated a pure culture of T. palladium, but no other scientist was able to repeat this finding; he also introduced a diagnostic test for syphilis that proved unreliable. He and Flexner were then discredited in their claim of cultivating the virus that causes poliomyelitis in monkeys. In 1918, Noguchi began traveling to investigate the causes of rare infectious diseases. Visiting the American West, Central and South America, and the Peruvian Andes, he attained important results concerning Bartonellosis (then called Carrion’s disease) and trachoma (a disease of the eyes). Controversy erupted around Noguchi’s work on yellow fever. In the 1920s, he announced that he had isolated the diseases bacterial agent, but he was later shown to have obtained the organism from misdiagnosed patients who had actually been suffering from hemorrhagic jaundice. Noguchi was criticized for drawing conclusions from insufficient research. In 1927 Adrian Stokes determined that yellow fever is caused by a virus, and Noguchi immediately traveled to Africa to conduct further research. He died of yellow fever on May 21, 1928, as he was about to return to New York. 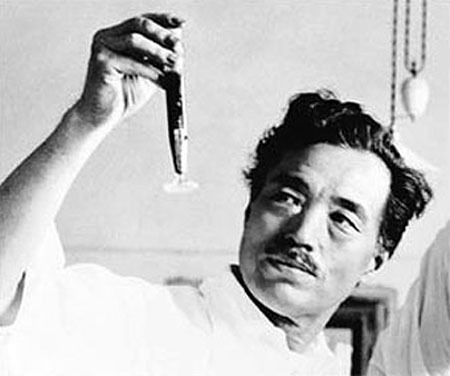 Noguchi’s research led to several disease treatments and contributed to the growing understanding of the organisms responsible for infectious diseases. By 1910, prior to Noguchi’s work on syphilis, Polish scientist PAUL EHRLICH developed a syphilis treatment, Salvarsan, which contained arsenic. While it was effective in curing syphilis, Salvarsan had to be administered carefully, because of the presence of arsenic. After Noguchi’s work in isolating the bacterial cause of syphilis, work continued unabated on finding safer and more effective drugs. By 1943, an effective one­ week treatment of antibiotics proved successful in treating syphilis in its early stages. Noguchi’s discovery that paresis is associated with syphilis represented a breakthrough in understanding the organic aspect of some psychiatric disorders. It was among the first demonstrations that pathogenic organisms can invade and damage tissues of the nervous system. Noguchi’s studies of Bartonellosis and trachoma aided the development of treatments for these obscure diseases. Despite his unsubstantiated claims, Noguchi received numerous honors and is remembered as a tireless and accomplished researcher.